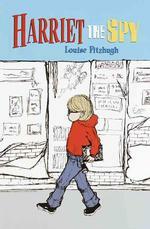 As in Harriet the Spy, by Louise Fitzhugh. I’ve been meaning to read this book for awhile now, but it just kept getting pushed back. However, when I saw it on our library eBooks page, I decided to download it for testing purposes (trying out features on our different devices). I ended up getting sucked into the story, though, so I kept reading! The story, if you don’t know, is about Harriet M. Welsch, a girl with an appetite for writing. She plans to be an author someday, and so she makes an effort to write down everything she sees, which has led to her becoming a spy. She makes notes constantly on her family, friends, and neighbours, while also remarking on her own thoughts about life. But when classmates get a hold of her notebook, which is full of less-than-pleasing remarks about all of them, things get out of control. I loved this book. I expected to like it, but I didn’t think I’d really love it. But it was fantastic. Now, when I was a kid, the movie version of this story came to theatres. I saw it in theatres, and it had a huge impact on me. I decided I was going to be a spy, and I made up my own toolbelt, and I had the invisible markers, everything. When the movie came out on VHS, I bought it, and I even remember the commercial before the movie began, because I watched it so intently. So I was thrilled to enjoy the book. Harriet the Spy is actually pretty deep, and fairly dark. It delves into the nice and not-so-nice aspects of humanity. Harriet has a caretaker who influences her greatly, and helps her to see the world in an endless-possibilities kind of way. But Harriet’s parents are clueless and, while they care about their daughter, they don’t care about their daughter. Harriet’s friends live in varying degrees of, I guess you would say class situations, and sometimes things get tough for some of these characters. Harriet included. When Harriet loses her friends, things get pretty dark. She has very hateful thoughts, and is sent to a psychologist for observation. The end message of the story isn’t exactly uplifting (Harriet learns to lie to her friends, instead of pointing out their flaws), but the way the ending was written worked for the story being told. Harriet is definitely not a perfect character, and at times she can definitely come off as selfish, rude, and mean. Which she is. But I think there is definite goodness in her, too, and intelligence, and a profound understanding of the world around her. I think we as readers have to see these aspects of her between the lines, though, as mostly what is written is the more vile aspects of her character. Definitely a great read, and I was surprised to find that the movie did, I think, an awesome job of sticking to the story and keeping the tone right! I love when a book surprises me, I might have to check it out. Awww…this brings back so many memories. I loved Harriet the Spy. She was one saucy character. I've never read this but it sounds like something I definitely want to check out. Thanks for the great review!